With a gradual build and little to nothing in the way of sudden movements, Kelly Reichardt has quietly announced herself as one of the best filmmakers living today. Capturing the fringes of society with hypnotic grace and a confidence in subtlety that demands close attention, she has created a small but remarkably strong body of work that is uniform in its quality. Reichardt continues to impress with Night Moves, her latest and most conventional film to date. It seems almost perverse that the midpoint of Reichardt’s new film is marked by something as crass and undignified as an explosion. 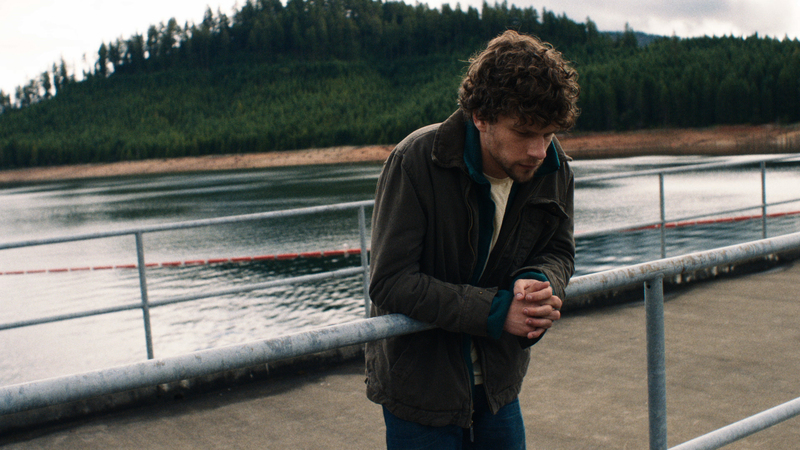 Night Moves charts the uneasy course taken by three radical environmentalists in their plot to blow up a hydroelectric dam, and slowly captures the various shades that wash across the face of their political extremism. As militant certainty, misguided rhetoric and skittish paranoia combine to propel a thriller in which the inviolable law of the ticking time-bomb is upheld well after its moment of detonation, Reichardt ratchets up suspense without ever losing sight of the surrounding big picture. The same cannot be said for the three eco-terrorists, all of whom share the misguided belief that their actions will result in some tangible ripple effect of awareness or change, instead of the palpable sense of making drops in the ocean, duly filmed with wry humour and sympathy by Reichardt. Led by self-made militant Josh (Jesse Eisenberg), high society dropout Dena (Dakota Fanning) and ex-Marine Harmon (Peter Sarsgaard) conceal a selfish undertow that nags at their cause. Saving the planet proves to be a source of adventure and a Purpose as good as any other for these two, and it is only when faced with the consequences of their actions that the strength of their convictions is truly tested. Night Moves provides a welcome counterpoint to last year’s The East, the cringe-inducing sincerity of which played disastrously against an eagerness to exalt the supposed adventure and espionage inherent to extreme activism. Reichardt refuses to get swept up in anything except her protagonists’ own increasingly muddied principles, and the results are a delicious tension at once familiar and alien to her palette. Anyone who has seen her brilliant western Meek’s Cutoff can attest to her skill behind the camera. Following an increasingly doomed group of settlers being (mis)led along the punishing Oregon trail, the tension that arises from the unseen and the unknown in masterful. Reichardt sows suspense into an enormous, vast landscape so visually at odds with the tension onscreen that the result is hypnotic, bewitching. She proves a dab hand again in Night Moves, offering scenes that first play off an immediate fear of getting caught in the act, then an equally satisfying sense of the paranoia that comes with the aftermath. If anything lets the film down it’s the absence of that near-mystical quality that infused Meek’s Cutoff with its dread and foreboding. Tethered to the more traditional propulsion of Night Moves’ plot, some of Reichardt’s quieter instincts as a director get drowned out by the film’s increasingly thunderous heartbeat. It’s a minor gripe about a film that dares to be low-key with high-stakes, Reichardt offering up another tightly-wound exercise in restraint, another essay on the unnoticed aspects of American culture. Meek’s Cutoff brought the long-invisible female side of America’s pioneering past to the fore, as Wendy and Lucy studied the present realities of small-town poverty amidst an uncaring social conscience. Beyond its suspense, Night Moves signposts some genuine questions concerning an American future of potential unsustainability, and the extreme places people are willing to go to answer them.